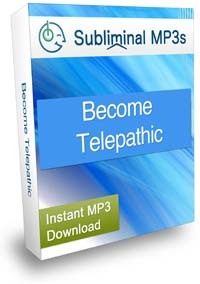 Become telepathic and experience the world and people around you from a totally different perspective with this subliminal mp3. Do you often wish you could communicate with someone only using your thoughts? Do you want to increase your level of perception? Do you want to develop your sixth sense? Do you sometimes think to yourself how great it would be to see events before they actually happen? Telepathics have the unique ability to sense information about others by "tuning in" to their energy and then literally reading them like a book. You can develop your skills as a telepathic by listening to this subliminal album. This album works in three main ways. Firstly, this album works to boost your belief in telepathic powers. It contains messages that will speak directly to your subconscious mind, because that's where your current mindset and beliefs about being telepathic is stored. So this album will simply taps into your subconscious mind to eliminate any negativity, doubts, or lack of belief, and replaces these patterns of thinking with with new ones to change your mindset from being doubtful and skeptical so that you will truly believe in telepathic abilities and that your psychic potential is limitless. Secondly, it works to expand your awareness, and to tap into a different way of receiving information. It will open your mind, expand your intuition and expand your consciousness and actually help you to develop your telepathic power. Your extrasensory perception will evolve and you will find yourself vibrating on a different level. Thirdly, it will help you to deeply focus and concentrate harder than ever before. You will go inside your own mind and open up to the world around you. You will focus and concentrate much deeper than ever before and be able to hold this level of concentration for longer periods of time. This will help you to receive and information telepathically. Much like a plant that has to be nurtured each day in order to grow, so will the development of your telepathic abilities. You won't become telepathic overnight but if you continue to listen to this album daily you will begin to notice your telepathic abilities growing stronger every day. You may suddenly get an overwhelming feeling you need to call someone you haven't spoken to in a while, only to find out they were thinking of you too. Or you may see images in your mind of a future event that is confirmed sometime later. These are the early signs of growth in your ability. Into the future you will find that you are becoming telepathic naturally and all of your senses are sharper than you have ever experienced before in your life. Your abilities let you see others and everything around you so much clearer, your telepathic communication skills will grow stronger and stronger and your ability to read and know other people will be very sharp.. You can interact with others on a much deeper level because you now relate to them on a spiritual level making your relationships with family and friends more loving and meaningful than before. Download this subliminal audio album today to enhance your mind and expand your telepathic awareness, naturally! This album is part of our subliminal psychic abilities range, it is just one of several metaphysical albums which aim to give you help in developing your extra sensory perception.